Immerse yourself in Vietnamese village life on a full-day tour from Hanoi to Van Giang that includes a cooking class in a family home. See the scenic Red River countryside, shop at a morning market, and make a classic Vietnamese lunch with your hosts, then tour a village with a centuries-old ceramics tradition. This tour is limited to 10 people, and includes all activities, lunch, and round-trip transport from your Hanoi hotel. Start with morning pickup at your hotel in Hanoi, and begin the scenic drive to Van Giang, leaving the city for a landscape of rice paddies and banana plantations. Upon arrival in Van Giang, visit the colorful morning market, the perfect place to get a glimpse of daily life in the village: join a crowd of locals as you browse stalls overflowing with fresh produce, handicrafts, and everyday items. The next stop of the day is the home of Mr. An, who tends a collection of Bonsai trees in his 150-year old house. 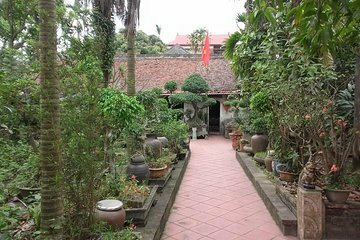 After checking out this rare example of historic architecture, continue to another village home, where you can roll up your sleeves and learn the basics of Vietnamese cooking. Prepare traditional spring rolls with sauce, then sit down to enjoy a home cooked lunch of local cuisine alongside your spring rolls and chung cake, a leaf-wrapped rice cake that’s an important part of holiday celebrations. In the afternoon, head to the nearby village of Bat Trang to see local potters in ceramics workshops. If desired, you’ll have time to browse for souvenirs and ceramics before making the return trip to Hanoi. Your tour concludes with drop-off at your Hanoi hotel. This was a fun and relaxing day with Alex (excellent). Wonderful host for cooking class and lunch. Very kind couple and delicious lunch.